Examining and interrogating the history of Mad Studies requires understanding the relationships within that history. The location and history of the institution provides framework for the context of the research being done within, as institutions are saturated in the history of the land. Specifically, what does it mean for a white, European settler at a land grant institution such as OSU to be working and researching in a field steeped in the lived experiences of Indigenous people and people of color? Much of the work being done in Mad Studies is limited to the perspectives of cis-masculine individuals and ignores the work of marginalized peoples. 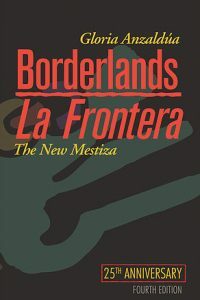 Lzz cites the work of Gloria Anzaldúa, a Chicana feminist, as being a critical influence on their wanting to pursue the study of Madness. 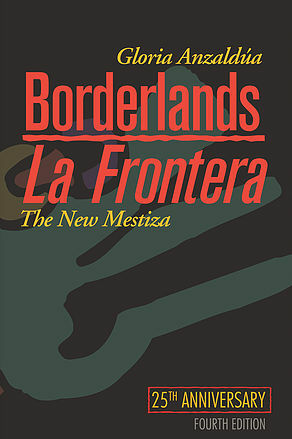 Anzaldúa wrote and theorized mind-body differences embodying what gets pathologized as Madness or disability. Lzz relates how the work of Anzaldúa exposed them to the concept of navigating overlapping interstitial spaces – or “the space between things, where things don’t fit; falling between, but not quite fitting into binary systems of identity, such as gender.” In this sense, Mad and disabled people are continually finding ourselves in ambiguous terrain. Lzz loves teaching and research and would like to pursue these endeavors after graduate school. They also enjoy community work and plan to be involved in outreach to young people who might need support in navigating their neuroqueerness, Madness, and/or mental illness. As someone who has experienced violent pathologization firsthand – fostering a sense of self-hatred instead of acceptance and celebration – Lzz feels that teaching can be one way to disrupt those violences and impact people’s lives in a tangible and meaningful way. You will not want to miss our interview with Lzz on Sunday, September 16th at 7pm. Listen live on KBVR Corvallis 88.7 FM or stream live. Also, check us out on Apple Podcasts! This entry was posted in College Health and Human Sciences, College of Education, College of Liberal Arts, College of Public Health and Human Sciences, College of Public Health and Human Services, graduate school, Healthcare, science communication, Women's and Gender Studies on 2018-09-16 by Lillian Padgitt-Cobb. How do bone cancer cells become resistant to chemotherapy? 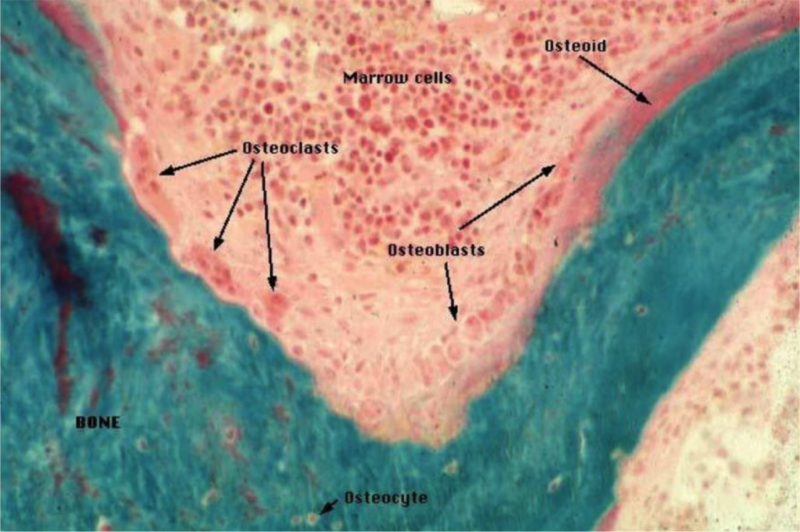 Limited treatments for bone cancer Bone cancer is a devastating and poorly understood disease with few available treatment options in humans. The disease disproportionately impacts young adults and children, and treatment still often includes amputation of the affected limb. Relapse within one year is common. Dogs can also spontaneously develop bone cancer, which makes them a suitable model for comparative oncology: insights about disease progression in dogs can yield insights about the disease in humans. Animal models – one size does not fit all The difficulty of establishing a robust animal model has impeded scientists’ ability to study bone cancer rigorously. For example, although mice are commonly used to study human disease, they do not develop bone cancer spontaneously. Invasive tumor tissue grafts are required to study the disease in mice, which adds confounding variables to the results – it is not necessarily clear if an observed effect is the result of the tumor or the grafting procedure. Understanding how chemotherapy resistance develops As a 2nd year Master’s student in the College of Veterinary Medicine, Marcus Weinman is working towards understanding how bone cancer tumors adapt and acquire resistance to chemotherapy. He has been developing canine osteosarcoma cell lines to study disease progression, which entails exposing cells to chemotherapy until they become resistant. Using a variety of molecular biology techniques, Marcus investigates how cells acquire resistance, and whether specific molecules or groups of molecules are more active or less active as resistance develops. The goal is to identify possible targets within the cell that might be sensitive to therapeutic intervention. Complexity of bone cancer cells Cells contain exosomes – small packages containing a diverse mix of molecules – that participate in signaling and transfer of molecules between cells. These compact cellular packages are being investigated for their role in the development of resistance. These tumor cells are also endocrine tumors – they express hormones normally found in other tissues, such as the brain and the gut – which adds a layer of physiology to the already-complex nature of cancer. Why cancer research? Originally from Denver, Colorado, Marcus knew he wanted to attend OSU to pursue research opportunities. He completed his undergraduate studies at OSU, and attributes part of his desire to attend OSU to a deep family connection to Corvallis – his grandfather was a professor at OSU! After completing his Master’s, Marcus plans to attend med school, with the eventual goal of becoming an oncologist, while maintaining his connection to research. He emphasizes how the teaching component of medicine is a motivating factor in his desire to become a physician. As a clinician, he would like to teach patients how to take care of themselves by integrating educational and interpersonal aspects of medicine. Join us on Sunday, July 29th at 7pm on KBVR Corvallis 88.7 FM or stream live to hear more from Marcus about his research and experience as a graduate student at OSU. This entry was posted in College Health and Human Sciences, College of Public Health and Human Sciences, College of Public Health and Human Services, graduate school, Healthcare, Linus Pauling Institute, science communication, Veterinary Medicine on 2018-07-29 by Lillian Padgitt-Cobb. Bone marrow transplants save lives, but can it keep our bones strong? What doesn’t kill you makes you stronger. This phrase is often helpful when fighting adversity, but it does not hold true for patients suffering from diseases such as leukemia, tuberculosis, and certain forms of anemia. Current medical science allows us to save lives, but their quality of life is curtailed because bones are typically weaker and prone to breaking as a result of cancer treatments. Patients may have endured countless surgeries, drug rehabilitation, and physical therapy only to have their level of physical activity severely limited because of the complications posed from fragile bones. Goldner’s trichrome staining, in which mineralized bone matrix, erythrocytes, and cytoplasm were stained green, orange, and red, respectively. Credit: Burr, David B., and Matthew R. Allen, eds. Basic and applied bone biology. Academic Press, 2013. 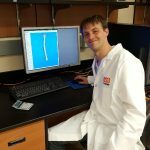 At the center of this problem is bone marrow, and working to find a solution is Richard Deyhle, a Masters student studying Radiation Health Physics, believes we may have found a way to treat these cancers while also increasing our bone strength to previous levels of functionality. This work is in the proof-of-concept phase so it’s still early in the framework of medical application to the public but there is little doubt this can provide miraculous benefits to cancer patients providing them a higher quality of life. Richard working on generating a 3D visualization of Micro-Computed Tomography data. First it’s important to understand that even though bone marrow only accounts for ~4% of our body mass, it’s also the production source of red blood cells (carrying oxygen throughout our body), blood platelets (helping to clot blood to prevent blood loss), and white blood cells (major players in our immune system keeping us healthy). Cancer treatments focus on treating and restoring the healthy function of bone marrow so we can live. Kind of important stuff! But the health of the bone marrow does not always correspond to strong bones. 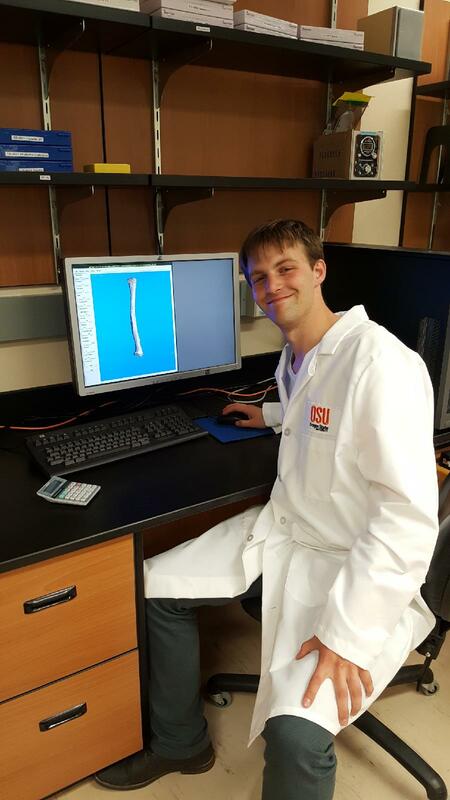 This is where Richard, working under Urszula Iwaniec & Russell Turner in the Skeletal Biology Lab at OSU, brings their expertise to find new ways to treat malfunctioning bone marrow. Micro-Computed Tomography image of the radius bone from a rat from Space Shuttle Mission, STS-41. Bone marrow is made of many subcomponents, and standard medical practice is to replace a patient’s bone marrow (containing all subcomponents) with bone marrow from a compatible donor. Depending on the extent of transplant, there are somewhere in the neighborhood of 5,000,000 cells that are replaced representing the mosaic of cells that make up bone marrow. Richard is using a more targeted approach of purifying bone marrow and isolating a subcomponent, called Hematopoietic stem cells, so a transplant will only need a few thousand of these special cells to perform the same function as the much larger transplant. Using mice models his lab has found similar results as other researchers showing the use of pure Hematopoietic stem cells, instead of bulk bone marrow material, has similar effects on bone marrow functionality. Through the use of Green Fluorescent Protein (as a bookmark in the newly injected cells allowing researchers to trace where cells move through the body), the Skeletal Biology Lab hopes to better understand the mechanism of bone strength resilience to a healthy functioning bone marrow. Like any good scientific study, much more work needs to be done to examine these results and verify effect sizes, but the road ahead looks promising. Richard’s childhood home was nestled away from large cities that allowed him to stare at the sky and see the Milky Way in all its beauty. Even at a young age he wondered about space, wondered how far humans can go, and wondered how he can help keep future explorers safe as we explore distant worlds. These youthful curiosities of space eventually lead to his research passion of understanding how radiation affects the human body. If all his plans work out he hopes to transition into a PhD program where he can focus more closely on making sure our fragile human bodies can explore worlds beyond ours. If you’re interested in new medical advancements that can be used to treat cancer or astronauts, you cannot miss this episode! Be sure to tune in Sunday May 7th at 7PM on KBVR Corvallis 88.7FM or by listening live. This entry was posted in College of Engineering, College of Public Health and Human Services, Nuclear Science and Engineering and tagged Bone marrow, cancer, GFP, radiation, stem cell on 2017-05-07 by Adrian Gallo. The majority of college students today had the privilege of transitioning from high school to college in a year or less, making the transition to higher education easy. I think it’s safe to say our freshman-selves would’ve argued with the term “easy transition”. But what happens if you needed a gap year to decide what major to pursue, or needed to work and save money so you could even pay for college. Unfortunately, this gap year (often years) for many students leads them to pursue a career without a higher education limiting their potential achievements in the long-run. Furthermore, many in disadvantaged socio-economic backgrounds don’t even consider the possibility of obtaining a college degree because it’s fiscally impossible, or they simply don’t know anyone who has a higher degree so they can’t relate to anyone. A college education has become a necessity in the job market, and in order for everyone to have a fair fight towards the American dream we need to level the playing field. Our guest tonight focuses on how social policy influences the accessibility of higher education to people of lower incomes, non-traditional, and first generation students. Terese Jones, a 4th year Ph.D. student in the College of Public Health and Human Sciences, explores the institutional and personal hurdles that prevent many people from obtaining a higher education. Imagine trying to pay for college when most scholarships are geared towards the younger demographic, or trying to adjust to a rigorous 10-week quarter system from a “9-5” job. You begin to see a picture of why going back to school after a career, or even a few years away from school, can become difficult to transition back into. 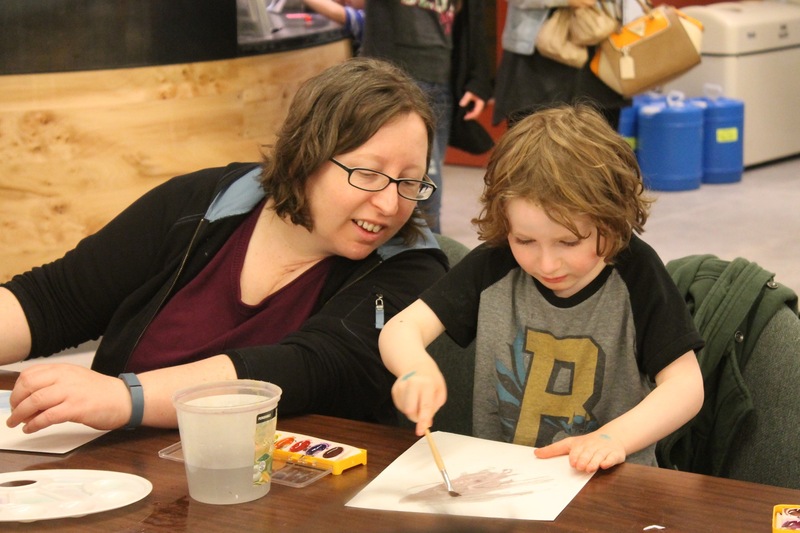 Terese and Quinlan painting together at the 2016 Bring Your Kid to Campus Day. Terese chairs the Student Parent Advisory Board at OSU, and works with the office of Childcare and Family Resources to advocate for affordable and accessible childcare for OSU students. There are many benefits to having children on college campuses, for both kids and college students. One of the theories Terese is exploring is called the cumulative advantage theory as a potential explanation for why students of lower socioeconomic status do not succeed to the same degree as their more affluent counterparts. Think about moving to an entirely new city where you don’t know anyone and need to find a job. If you have money in the bank you can get an apartment and start looking for a job in your field; however if you’ve moved with no money you’re likely to take the first job coming your way to pay for an apartment before you ever think of looking for a job you will enjoy. 30 years later the person who had money has advanced in their career far quicker compared to the person who arrived empty handed. The benefits of a small advantage at the beginning of ones life, produces a disproportionate benefit through their life-course when compared to someone who did not have the small advantage at the beginning. Terese also remembers her mother going back to school to finish her GED when she was only 12, but the difficulty her mom had with finishing school while maintaining a full household was extremely challenging. Even though Terese has extensive experience with the social system working in Chicago with the homeless, and Seattle at a women’s shelter, she still found that some applications and processes were just plain confusing and hard to fit into her schedule. This troubling experience led her to realize even though she’s familiar with the paperwork, the process was not trivial which gave her the motivation to pursue a higher degree at Oregon State. Quinlan and Terese, after completing the Turkey Trot! The family that runs together gets leg cramps together! Tune in tonight to hear this terrific story of how Terese aims to continue helping others as she focuses on some programs at Linn-Benton Community College can increase the chances students attend and finish a college degree. You can listen online here or on 88.7FM at 7PM! This entry was posted in College of Public Health and Human Services, Healthcare and tagged Cumulative Disadvantage Theory, first-generation students, gap year, non traditional students on 2016-06-26 by Adrian Gallo.